ZTE's presence at this year's IFA wasn't spectacular in terms of booth size, but the company didn't go unnoticed by us. The Chinese had a new trio of smartphones to show off, one for each pricing tier. Let's start off with the relatively high-end and work our way to the affordable offerings. The ZTE "flagship" that made its debut at IFA is the Blade Vec 4G. The slim LTE-enabled smartphone features a 5" 720p LCD display and a 7.8mm thin body. We liked the vibrant colors and good viewing angles of the phone. 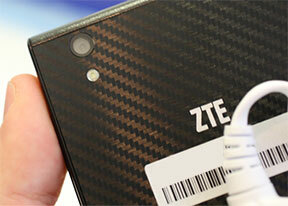 Contrast was also okay, but we would've preferred ZTE to fit its high-spec smartphone with a 1080p display. Still, it was quite sharp despite the fact you could see individual pixels if you really tried. Under the hood of the ZTE Blade Vec 4G operates a Snapdragon 400 chipset with a 1.2GHz quad Cortex-A7 processor and 1GB RAM. The phone has Cat. 4 LTE connectivity (up to 150Mbps downlink), tri-band 2G, dual-band 3G, Wi-Fi b/g/n and Bluetooth 4.0. There's 16GB of storage with a microSD card slot. Aesthetically, the phone looks very pleasing. The carbon finish on the back combined with the glass design is cool to say the least. Its 170 grams weight is very well distributed, too, and as such feels great in hand. Android 4.4 KitKat runs smoothly and the UI experience is what you'd expect without too many crazy alterations going on. In spite of its thin profile, the Blade Vec 4G boasts a battery of 2300mAh. There's 16GB of storage with a microSD card slot, which is always nice to have. Expect the phone to start selling in Turkey, France, Romania, Slovakia, Belgium, Norway and Sweden (if it hasn't already) shortly with a price of €230. Don't confuse the Vec 3G with its LTE-packing counterpart. Both inside and out, the two differ from one another substantially. The phone keeps the 5" 720 LCD display as its more expensive brother, but on the inside it packs a MediaTek MT6582 chipset with a 1.3GHz quad-core Cotex-A7 and 1GB of RAM. We didn't notice marginal differences in the performance, but since the MediaTek chipset is cheaper than the Qualcomm-made Snapdragon 400, the Blade Vec 3G is lighter on your wallet with a price tag of €180. For that price you get an 8MP snapper at the back and a 5MP one at the front. Unlike the Blade Vec 4G, which has to rely on a 1MP (or 2MP, depending on the market) camera for selfies. Visually, the Blade Vec 3G is 4mm shorter than its LTE counterpart and the back is with a matte finish. It still rocks a carbon apparel, though. Finally, there's the ZTE Kis 3 Max, which is the company's lowest-end smartphone to visit IFA 2014. It features a 4.5" FWVGA screen with an old TN TFT matrix. Needless to say, it's neither sharp, nor particularly eye-catching. At least, the phone is light at 135 grams and its plastic feels nice to the touch. On the outside it reminds us a lot of previous Xperia smartphones and we have to point out that the capacitive buttons below the display look particularly cool. They glow blue (almost purple) and are definitely a key aesthetic feature for the phone. At the back, the Kis 3 Max features a 5MP snapper coupled with a 2MP at the front. The MediaTek MT6572 chipset with a dual-core 1.3GHz Cortex-A7 CPU runs Android 4.4.2 KitKat okay. We noticed a few stutters here and there, but nothing that would classify the phone as unusable. There's also 512MB of RAM and 4GB of internal memory (microSD card slot is present). The connectivity is similar to the Blade Vec 3G - tri-band 2G, dual-band 2G, Wi-Fi b/g/n, Bluetooth 3.0. The battery is smaller than the Blade Vec's, 1,850mAh. The phone carries a price tag of €100 and is destined to launch in the UK, Germany, Greece and Bulgaria.